Prime Minister David Cameron is partially responsible for the deaths of hundreds of migrants who drowned off the Libyan coast on Sunday due to his ‘fanaticism’ in ousting former dictator Mummar Gaddafi, Nigel Farage has said. The leader of UKIP said Cameron, along with other European leaders, must take some blame for the deaths of the migrants, as their decision to topple Gaddafi lead to the destabilization of Libya. He added that prior to Gaddafi’s fall, fewer migrants from the country attempted to cross the Mediterranean. Rescue operations are continuing after a boat carrying over 700 migrants sank 60 miles off the coast of Libya, with hundreds feared dead. The incident follows a similar disaster last week where 400 people drowned. Farage said: “It was the European response that caused this problem in the first place. The fanaticism of [the former French president Nicolas] Sarkozy and Cameron to bomb Libya – what they have done is to destabilize Libya, to turn it into a country of much savagery and a place where for Christians the situation is virtually impossible. Other UKIP members have used the disaster as a platform to promote their anti-EU policy. Victoria Ayling, candidate for Great Grimsby, told BuzzFeed News the catastrophe could have been prevented if Britain had left the European Union. 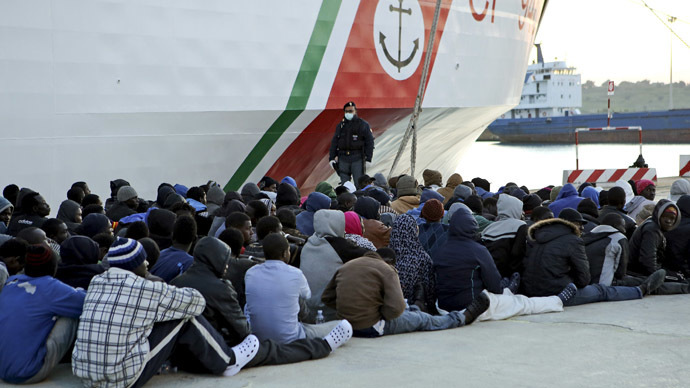 The UN High Commissioner for Refugees, however, blamed the high death toll on anti-immigration rhetoric from European politicians, saying they had blocked attempts to create huge search-and-rescue operations across the Mediterranean. “Stopping this needless suffering is a huge international challenge, which demands a comprehensive, coordinated response. We must target the traffickers who are responsible for so many people dying at sea and prevent their innocent victims from being tricked or forced into making these perilous journeys,” he added. European interior ministers and police officials are meeting in Luxembourg on Monday to attend emergency meetings to decide how to best deal with migrant boat disasters. The meeting was intended to be a routine meeting of foreign ministers and diplomats, but has been turned into a crisis meeting to respond to the outrage at the high levels of migrant deaths in the Mediterranean.